Lost the password to open your PDF or Office document? How to break the password so that the file can be modified without restriction? Just like PDF documents, Office Word/Excel/PowerPoint files can also be protected by two different levels of passwords. A file open password prevents users from opening / viewing the contents unless they know the password, while a file modifies password restricts anyone from editing the documents. 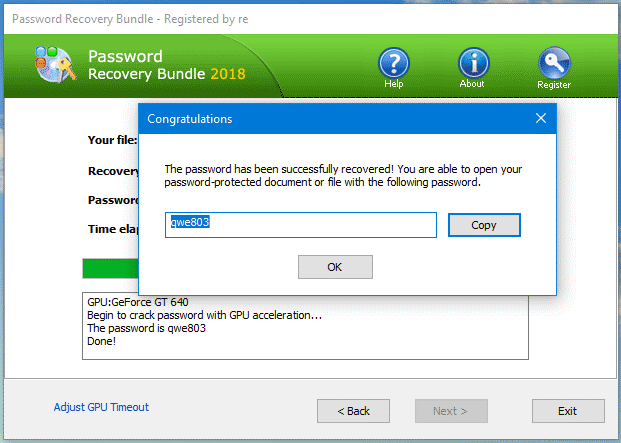 With Password Recovery Bundle you can instantly remove the file modify passwords of PDF, Word, Excel, PowerPoint documents, and quickly recover the file open passwords using GPU hardware acceleration. Disclaimer: Use this tool to recover PDF/Word/Excel/PowerPoint passwords when you have the legal right to view & edit the document, but you’ve forgotten their password. Don’t use them for illegal purposes. 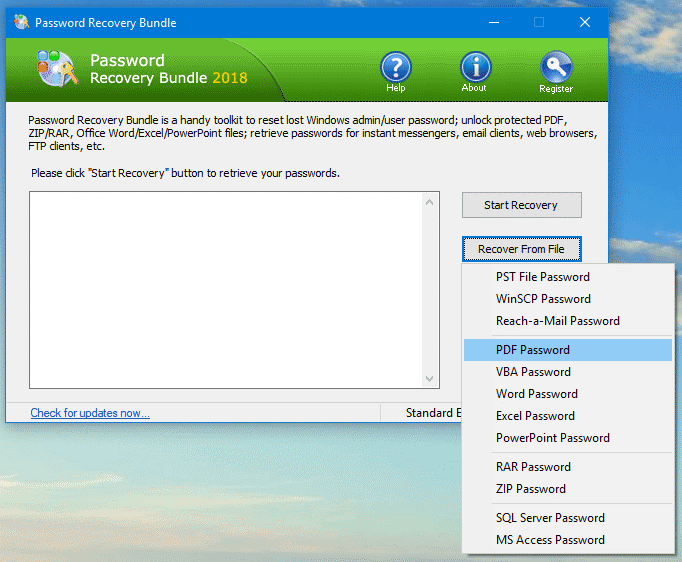 Password Recovery Bundle is all-in-one toolkit that lets you bypass forgotten Windows password; Unlock all types of password-protected files (doc, docx, xls, xlsx, ppt, pptx, accdb , zip, zipx, rar, pst, vba, pdf); Retrieve saved passwords from your email clients, instant messengers and FTP softwares; Find lost product keys for Windows and Office; and much more. A powerful graphics card is good for more than just gaming, turns out its parallel processing power is excellent for cracking passwords. Even a low-end NVIDIA or AMD GPU can crack a password about 20 to 40 times faster than a CPU alone. 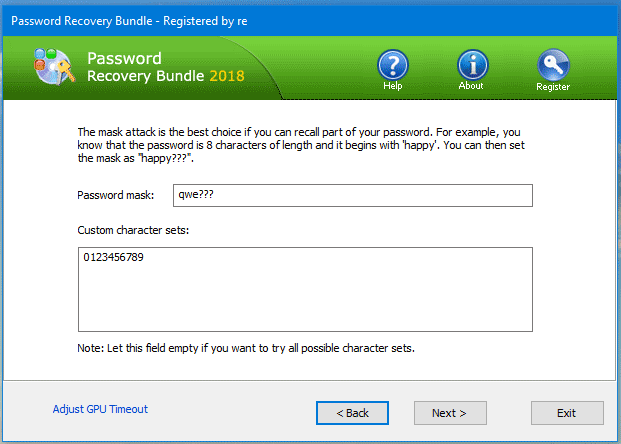 Password Recovery Bundle uses the computing power of CPU and GPU to achieve the highest performance and it is uniquely optimized for all modern AMD and NVIDIA graphics cards. In this tutorial, we’ll walk you through the steps of using it to recover PDF, Word, Excel, PowerPoint password with GPU acceleration. 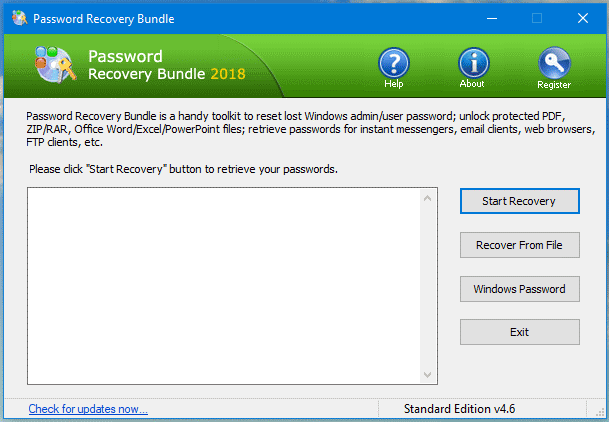 To begin, download Password Recovery Bundle from its official website. After you’ve downloaded it, double-click the setup file and follow the simple wizard to finish the installation. 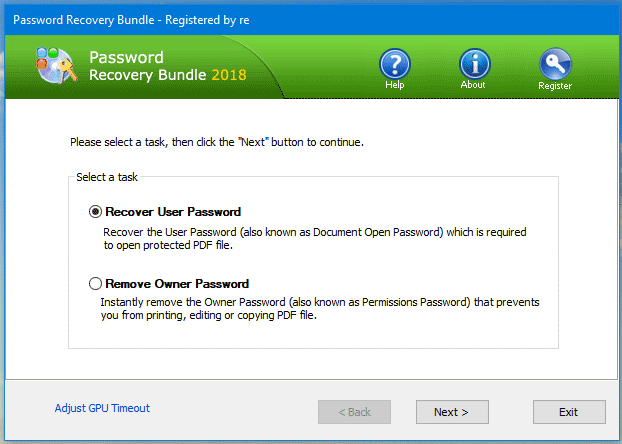 When Password Recovery Bundle opens up, click the “Recover From File” button. You’ll see a list of options for recovering your documents, archives and database passwords. For example, if you want to unprotect an encrypted PDF document, just select the “PDF Password” option. 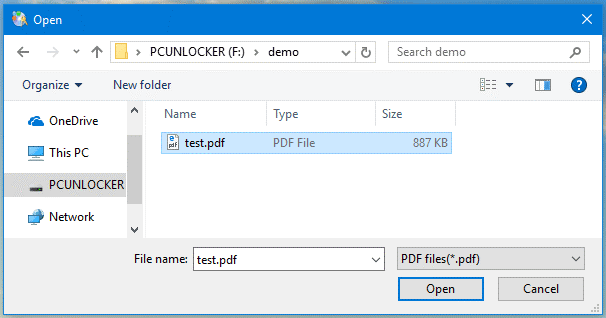 When the File Browse dialog opens, select the PDF file that you want to decrypt and then click Open. 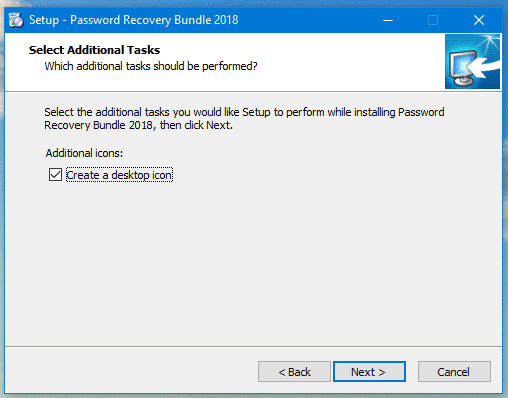 The next window will prompt you to select the recovery task: Recover User Password or Remove Owner Password. If you’re unable to open/view your PDF file, you should select the first option. While selecting the second option will allow you to instantly remove the permissions password that protects your PDF from being printed/copied/modified. 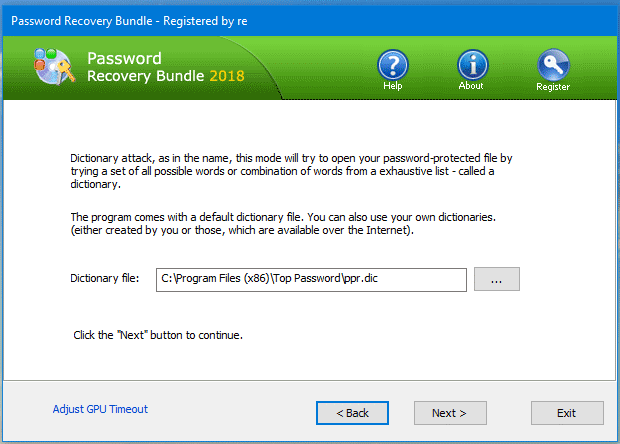 When you’ve chosen to recover PDF user password, the program offers 3 password recovery methods: Brute-force attack, Mask attack, and Dictionary attack. Each method has its advantages and disadvantages. Brute-force Attack – Checks all possible characters combinations until the correct password is found. The success of the attack depends on password length and the combination of characters, letters, and special characters. After you customize the attack settings and click Next, the program will begin to recover your forgotten password with GPU acceleration. A high-end GPU such as NVIDIA GTX 1080 can crack passwords up to 250 times faster compared to a CPU. The password cracking process won’t stop until your password is found. For testing purposes, we’ve locked a simple PDF with the password “qwe803” and Password Recovery Bundle can deliver the result in under fifteen minutes. 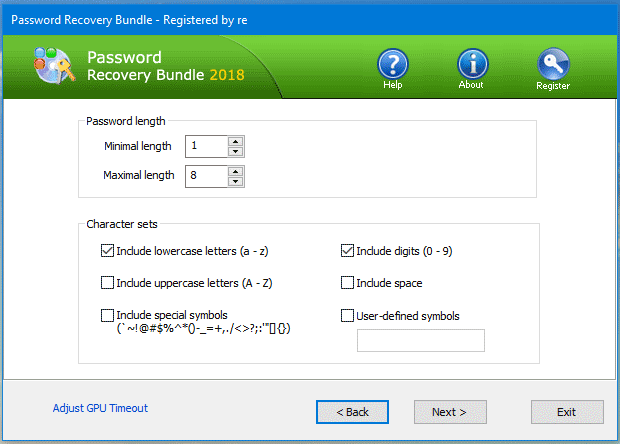 Password Recovery Bundle is an extremely fast password cracking tool to recover lost passwords of your PDF, Word, Excel, PowerPoint files because it takes advantage of GPU acceleration technology. Did you find this tool helpful? Which tool do you use for cracking PDF/Word/Excel/PowerPoint document? Tell us in the comments below.